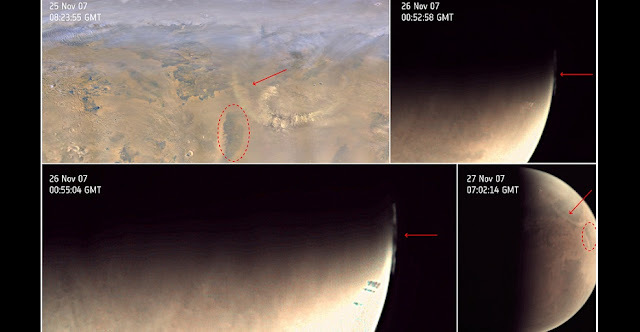 An unprecedented catalog of more than 21 000 images taken by a webcam on ESA’s Mars Express is proving its worth as a science instrument, providing a global survey of unusual high-altitude cloud features on the Red Planet. The low-resolution camera was originally installed on Mars Express for visual confirmation that the Beagle-2 lander had separated in 2003. In 2007 it was switched back on and used primarily for outreach, education and citizen science, with images automatically posted to a dedicated Flickr page, sometimes within just 75 minutes of being taken at Mars. While these limb clouds can be imaged by other instruments or spacecraft, it is not necessarily their main task – they are usually looking directly at the surface with a narrow field of view that covers a small portion of the planet for specialized study. By contrast, the webcam often has a global view of the full limb. The catalog of some 21 000 images taken between 2007 and 2016 were examined and 300 identified for the study. Temperature variability and water vapor content according to the season, as well as atmospheric dynamics, can also play a role in the visible characteristics of the clouds.